From Chapter 6: "Horse With No Name" is one of those songs in The Cusp of Everything that its creators might wish had been omitted. In the book, Karen goes to a party at co-worker Eric's house - he's the guy with terrible taste in music. When she gets there, she says, "America’s 'Horse With No Name' is playing. I think there is only one note in that song. It kills all the energy in the room. The twenty-watt light bulbs don’t help either." The party goes downhill from there. 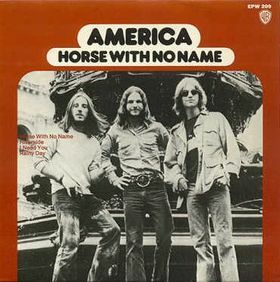 "Horse With No Name" was America's first and most successful single, staying at number 1 for three weeks in 1972. Later in Cusp Karen calls another song "the 'Horse With No Name' of dance music." Any guesses as to what that 1975-era song might be?